This fast food restaurant has gone through quite a few owners. 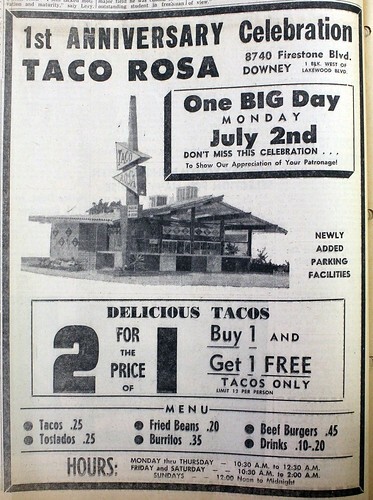 When this newspaper ad appeared in the 1960s (I'm guessing based on the prices), the place was celebrating its first anniversary as Taco Rosa with a 2 for the price of 1 offer (limit 12 per person!). Originally, the place was a Taco Pronto. Somewhere along the line, I remember a Green Burrito. Currently, it's a Tacos Don Chiente. The prices have gone up a bit, but the one thing that's stayed the same is the Mexican theme. Yum! The sign on this place drives me nuts! If you want to get on the left turn lane on Firestone when leaving the bank or the shop next to it, the sign doesn't let you see the incoming traffic. Still, yum! I wouldn't mind trying that place someday! Nice photo. Don Chiente is our current favorite Mexican take-out. Lots of good food at reasonable prices. Nice photo comparison. I've eaten at that place, good food.